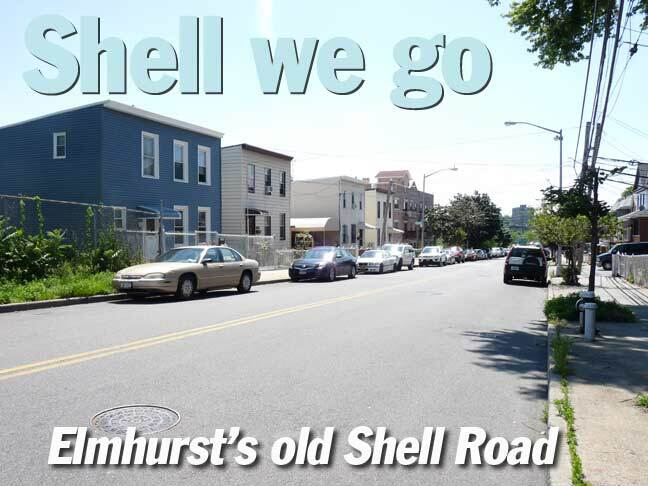 Though it has been over century since it was known as Shell Road, an ancient east-west Queens thoroughfare connecting the banks of Newtown Creek with downtown Elmhurst remains largely intact. While idly meandering from Corona back to the Long Island Rail Road Woodside station the other day, I found myself along part of this route and it turned out to be a part I had never walked before. First, a bit of background. 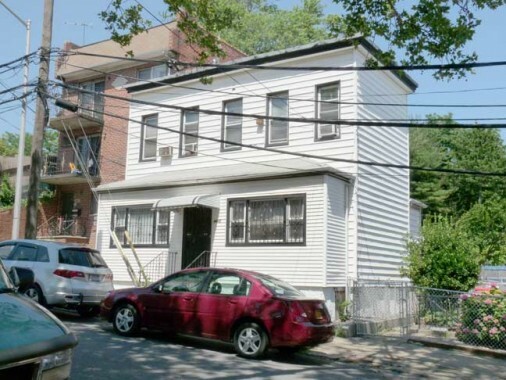 Laurel Hill, the little-known Queens neighborhood between Calvary and New Calvary Cemeteries, today is known as West Maspeth, and, like Blissville, it is a small, isolated little village, with heavy industry dotted with ancient one-family houses. 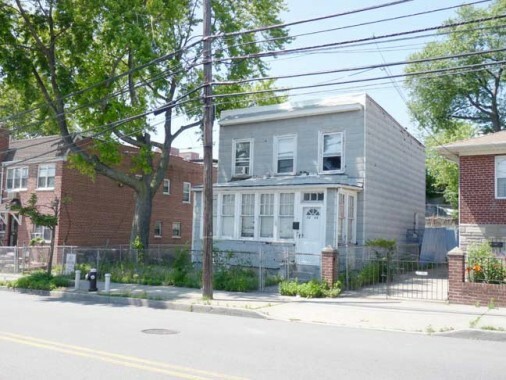 It’s hemmed in by Calvary Cemetery/Brooklyn Queens Expressway in the west, the Long Island Rail Road to the south, the Long Island Expressway to the north, and pedal-to-the metal 58th Street, a main truck route, to its east. Its original name is remembered by Laurel Hill Boulevard, which buddies up with the Brooklyn-Queens Expressway for most of its route from the old Penny Bridge Long Island Rail Road stop northeast to Queens Boulevard. In 1840, engineers constructed a new road from Penny Bridge on the Creek to Newtown (today’s Elmhurst) built with the finest pavement available at the time: crushed oyster shells. It was alternately known as the Newtown Turnpike and Shell Road. Today, its route is still definable by Laurel Hill Boulevard, the Brooklyn-Queens Expressway, and 45th Avenue. The road ended at Broadway just north of the LIRR. Today, Laurel Hill Blvd. functions mainly as the BQE service road, though it breaks free at western end at Calvary Cemetery and also for a few blocks at its eastern end in Woodside (right). Coney Island, Brooklyn has kept its own ancient Shell Road. In this map we have moved forward to 1915. 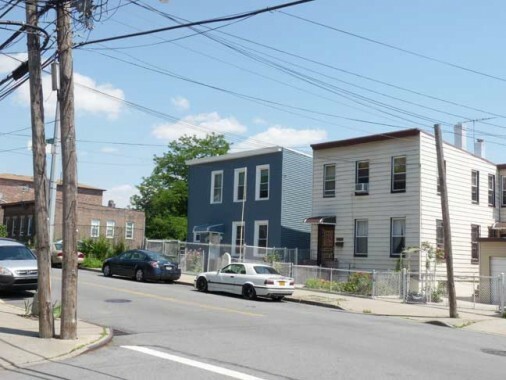 By then all of Shell Road/Newtown turnpike had acquired the Laurel Hill Boulevard moniker, while Queens Boulevard had embarked on a widening project that would bring it to its current width. Within a few years, Queens’ streets would be numbered and Shell Road east of Queens Boulevard will be called 45th Avenue. 69th Street, an important north-south street, was called Fisk Avenue, a name still used on the Flushing Line #7 train station. 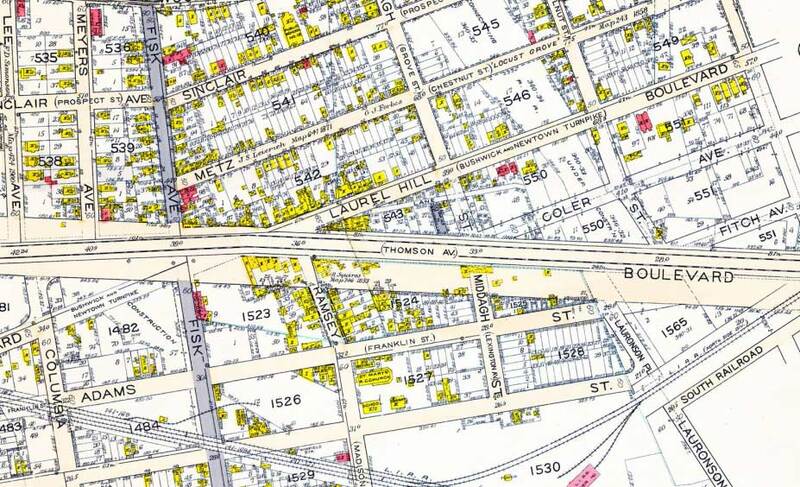 The V-shaped junction of Queens Boulevard and 45th Avenue created a near-triangular plot. I’ve always been fascinated by buildings shaped like this, and would like to have a room with just the one window facing west. The front door looks original. Note the grade difference between Queens Blvd. and 45th Avenue. Here, the Boulevard runs through a valley, while 45th Ave. ascends a hill. 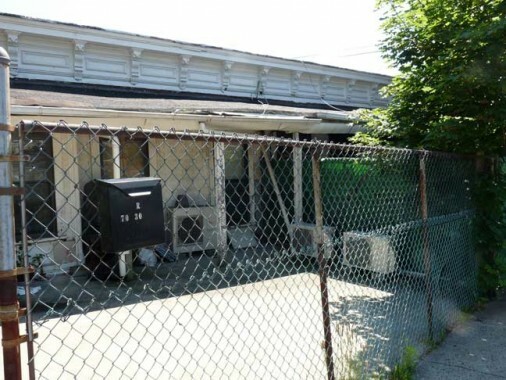 This stretch of 45th Avenue is scattered with curious dwellings of a very old age. 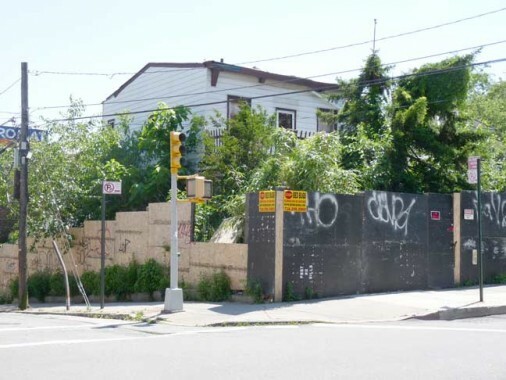 Along the south side of the avenue are a group of 4 or 5 one-story buildings arrayed at the top of the hill overlooking Queens Boulevard. All are protected assiduously by fencing of varying opacities. Otherwise, this stretch of the avenue (here at 72nd Street) features wood frame salt box dwellings that might go back as far as 1850, just 10 years after the turnpike was built. All have, of course, been given new aluminum siding hat masks their age. 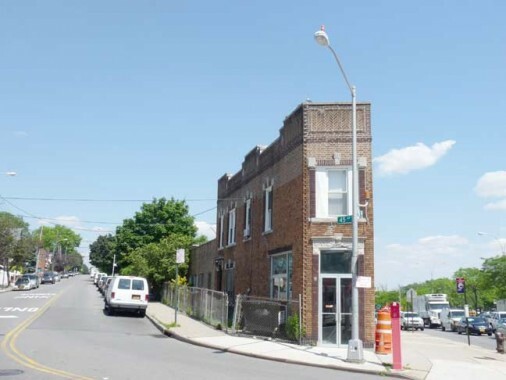 Detouring to 44th Avenue, a recent teardown has left a temporary view to this gabled and peaked brick building. Another flat-roofed building over a century old. The interior porch was probably added decades later. You can tell the difference, age-wise, between this building and the two on either side. A brick building atop the severe downslope just south of 45th Avenue. The first floor is below the sidewalk. A stucco-sided building with a cupola alongside the Connecting Railroad, which bisects this part of Elmhurst. 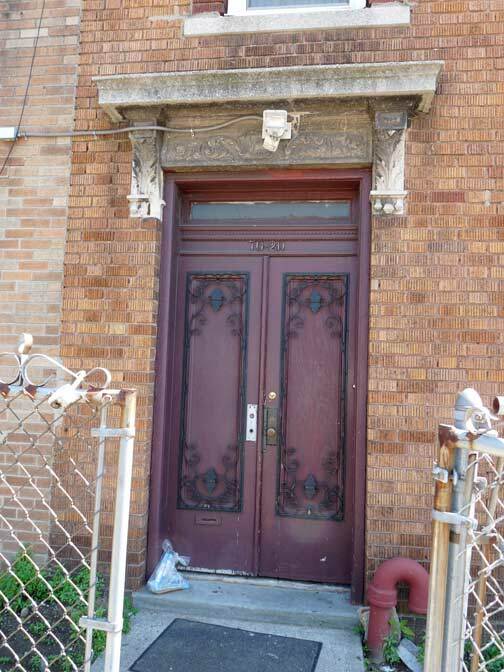 At 74th Street, this building has served proudly for perhaps 150 years — it’s being forcibly retired. 76-11 45th Avenue is unique among “Shell Road”‘s houses in that it has a huge lawn. There’s also a sunny interior porch in front. 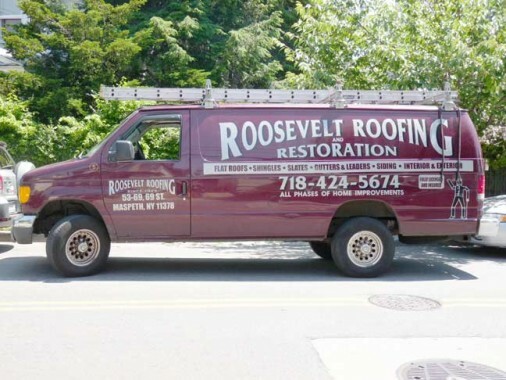 Roosevelt Roofing’s original location on Roosevelt Avenue and 70th Street was disloacted by the Brooklyn-Queens Expressway, but they later moved to Woodside Avenue and 71st Street. At both locations, the company displayed its trademark, a large tin man figure perhaps inspired by L. Frank Baum. Unfortunately the tin man has disappeared since they moved again to 69th Street. 45th Avenue / Shell Road ends at Broadway and Moore Homestead Park, near the heart of old Newtown. 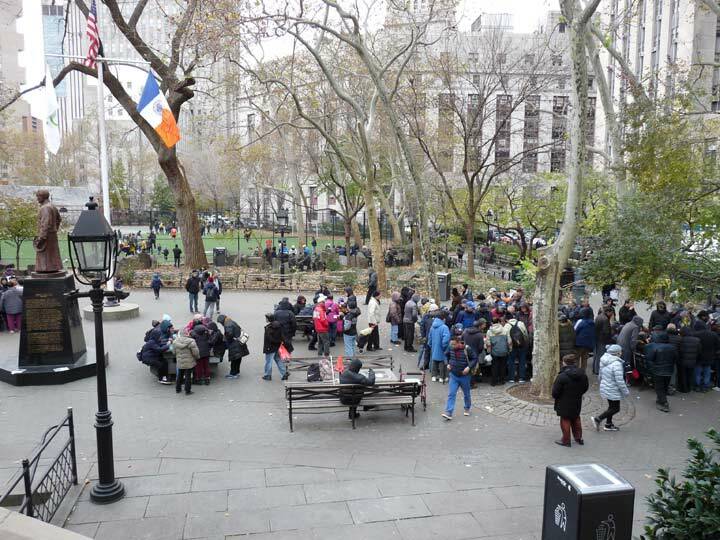 The park is named for the colonial era family the Moores, which produced Clement Clark, the composer of “‘Twas the Night Before Christmas,” and the ancient house that stood here until the early 20th Century. 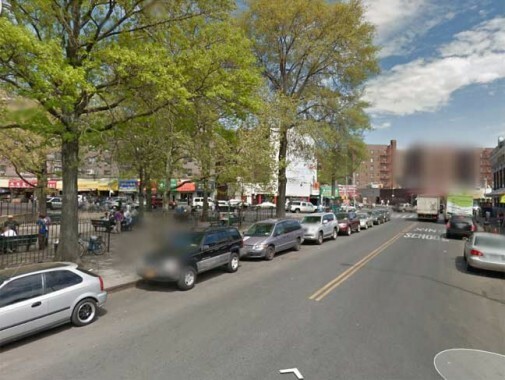 BTW, how does Google decide where to put the blurs in its street view scenes? 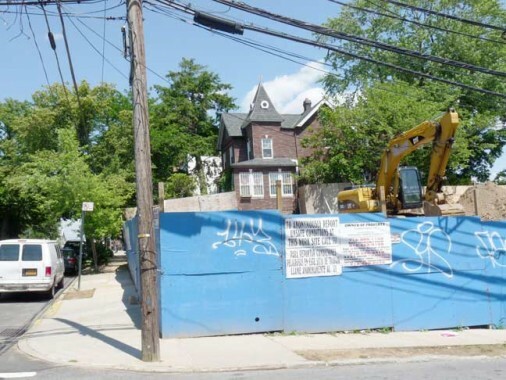 The long history of this site features colonial settlers, a tasty apple, a beloved children’s poem, subway construction, and a neighborhood playground. In the mid-1600s Captain Samuel Moore was granted eighty acres of land in the area to recognize the efforts of his father, Reverend John Moore (1620-1657), in arranging the purchase of Newtown from local Native Americans. Captain Moore built a house here in 1661, and the property was handed down from generation to generation of his descendants. 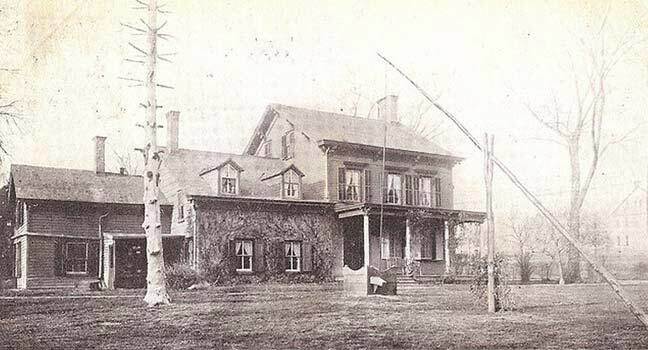 During the Revolutionary War, the British General William Howe made his Long Island headquarters at the homestead. The site is also known as the birthplace of the famous “Newtown Pippin” apple. In the Dirty Thirties, NYC was relentless about bulldozing or otherwise destroying historic properties before preservation laws were on the books, and the Moore homestead didn’t survive the construction of the new IND subway under Broadway in 1933. The land where the house had ben became a playground in 1954 and was renamed for the homestead in 1987. 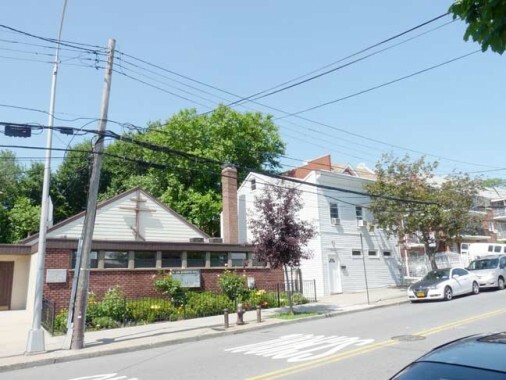 Meanwhile, two Moore burying grounds survive: a hidden one in a playground at 90th Street and 56th Avenue, and the Moore-Jackson Cemetery on 54th Street between 31st and 32nd Avenues in Woodside. I swear I’ve seen those houses at 72nd St before, many times. Same size & shape, same almost flat roof with little or no overhang, same door & window pattern. Same door & window pattern both floors, maybe apartments. I suspect these are examples of cookie cutter low income housing of their time. So maybe aluminum siding doesn’t make them look any more or less classy than they ever did. Still,they have potential that wasn’t taken advantage of this time, maybe next remodel. 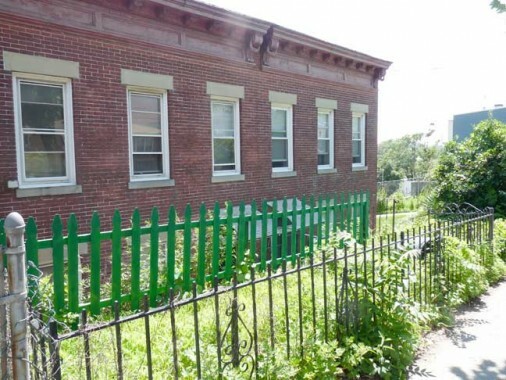 Actually, from a photo it’s hard to tell exactly what the siding is. The only hint is the narrow corner & window trim, like the trim channels typically used with aluminum & vinyl sidings. Kevin, I’ve always wondered exactly what you dislike so much about aluminum siding, even though I agree about disliking it. Is it just the aluminum or do you include other phony wood imitators like vinyl siding in the term “aluminum siding”? Is it the narrow/minimal trim look? Or is it the horizontal line, even if real wood? Moving down a couple pictures, I like the narrow flat roofed house with the enclosed porch. Has character. Got to ask, what kind of siding? Is that a shadow or a dent I see at the bottom of the end of the porch? Sadly, I doubt this is wood siding & this house is less because of that. One more picture down, the older home between two newer brick homes. Love the porch,not much else. 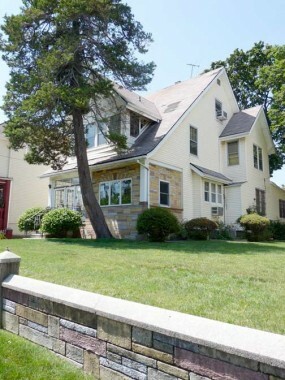 Is that that awful asbestos shingle siding embossed to look like wood shingles on that house? I hated putting that crud up. The boxy Italianate-style house became common around the Civil War in many Eastern towns and cities. It derived from slightly earlier masonry examples, and they, in turn, from the first high-style, Downingesque “Tuscan villas” of the 1840s. The frame versions were usually modest and pretty easy to erect, rectangular in plan and with a shallowly rearward-sloping roof typically framed front to back, with the rafters resting on a transverse beam in the middle of the roof. They were often detached, but their regular shape made them suited to semi-detached and row construction. The principal decoration was a cornice across the top of the facade, which seldom returns to the sides. 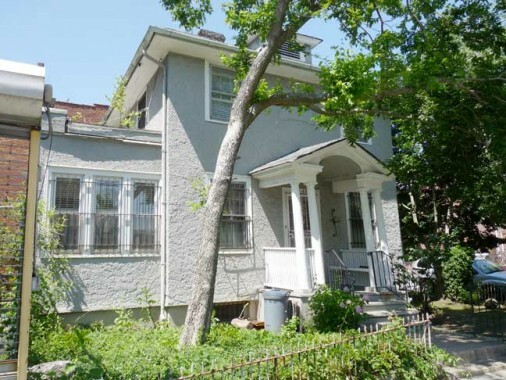 Similar houses were constructed in some areas in the 1920s, and there’s a relationship with the false-front commercial buildings that were commonly built unti then (including in Western movies). Aside from the issues of material and finish themselves, the problems with aluminum siding are two. First, it is usually applied over the original wood siding, so that it covers most trim, such as friezes, window casings, and corner boards. It also typically has a significantly greater exposure—i.e., width—than the various types of historic siding it covers, changing the scale of the elements relative to the whole and reducing the texture. The good news is, when aluminum siding is removed, the original siding is often well preserved underneath. “Otherwise, this stretch of the avenue (here at 72nd Street) features wood frame salt box dwellings that might go back as far as 1850…”. Traditionally, a salt box would need to have a two-story front facade, and a peaked roof leading down to a one-story facade on the rear. Generally these houses in northern climes would be oriented with the taller facade facing south for warmth and light in the winter months, and the shorter side facing the cold northern breezes. I think you can request to have your house/property blurred in Google Street View if you want to. I came outta 75th St & Woodside Ave.
Been up & down those streets a million times. Amazing what you DON’T see in your own neighborhood! hey peglegguy you wouldnt have been the station master for the paper office of the long island star journal/ long island press would you? my brother and i worked there in the mid 60’s. Google Maps use an automation program to find any faces and blur them out to protect people’s privacy, since they assume that people do not want their picture to be taken. Can’t seem to find that 45th Av home with the nice lawn anymore. Not that the original commentators are around anymore likely, but I’m sure they’d be chagrined to see even their much-derided aluminum-sided single family homes of yesteryear on the way out for brick multi-unit boxes.